Distribution and habitat: Platycerium grande is coming from the Philippines where in growing on tree branches near cultivated plants. Apparently Platycerium grande did escape from cultivation in the early stages of becoming established in the wild. 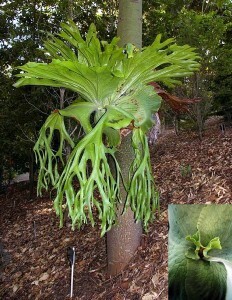 It grows on both trees and rocks, usually in rainforest. This ferns are epiphytes, using trees for support only; they do not obtain nourishment or water from the host tree as would a parasite plant do. Photosynthesis takes place in the green fronds just like any ordinary plant leaf. But the overlapping brown fronds near the base of this fern serve to trap falling debris such as dead insects and pieces of plant material; this is where the fern gets its minerals and other nutrients that most plants would get through their roots from the soil. Description: Platycerium grande is an epiphytic fern (a fern that grows on the branches of tree canopies or on fallen logs). It is a large fern that produces enormous sterile fronds, like a large battle shield, with forks off of the top edge. The fertile fronds up to 2m (6 feet) length, have two lobes with long fingers hanging down off of their lower edge. In between those two lobes, on the underside of the frond is a large spore patch. Each fertile frond also has a second spore patch located on the lower side of a large triangular lobe. Platycerium grande is very similar with Platycerium superbum. Platycerium grande can be identified from other Platycerium species by having two spore patches, no frills around the growth bud and having thin papery sterile fronds. Houseplant care: Platycerium grande ferns are best suited to greenhouse cultivation, but can be grown in the home if water is supplied regularly. Platycerium grande is advisable to be mounted on a sphagnum covered wood plaque. This fern does not do well growing on a hanging basket. Clean the fronds of Platycerium grande by leaving them in gentle rain in mild weather or by mist-spraying them; Wiping them with a soft cloth or sponge is not a good idea as it will remove the attractive felty scurf. Do not allow water to remain on the fronds. Light: In nature, Platycerium grande usually grow high up in the branches of the trees; thus, they strive in bright light. Strong direct sunlight, however, will rob the fronds of much of their colour and may cause unsightly markings. Keep them in bright light without direct exposure to sun. If only artificial light is available, they should have at least 4300 lux (400 foot-candles). Temperature: Platycerium grande like temperatures up to 24°C (75°F) as long as humidity is kept high. These plants should be mist sprayed once a day when they are grown in warm rooms. An ideal summer temperature is about 21°C (70°F) with a minimum winter temperature of 13°C (50°F). Airy, well ventilated situation suit these plants best. Water: During the spring and summer give to Platycerium grande enough water at every watering to make the potting mixture thoroughly moist, but allow the potting mixture to dry out almost completely before watering again. During the rest period water these ferns much more sparingly than in the growing period, giving only enough water to make the mixture barely moist throughout. Because the ‘shield’ frond often covers the surface, it may be virtually impossible to water some potted Platycerium bifurcatum from above. The way to solve this problem is to submerge the root portion in a large container of water until it is soaked. During the active growth period leave the plant in water for 15 minutes or so at each watering. During the rest period leave the plant in the water for no more then one or two minutes at a time. Whatever the plant is growing actively or resting, do not soak it again until it is obviously in need of water, which will be indicated by abnormally droopy fronds or by an evident loos of weight of the plant. Feed: Feeding is rarely necessary, but mature plants – especially those growing on bark – should have two or three applications of standard liquid fertiliser during the period of active growth. For a satisfactory feeding, the bark section that carries the roots should be immersed for a few minutes in the fertiliser solution until it is thoroughly soaked. 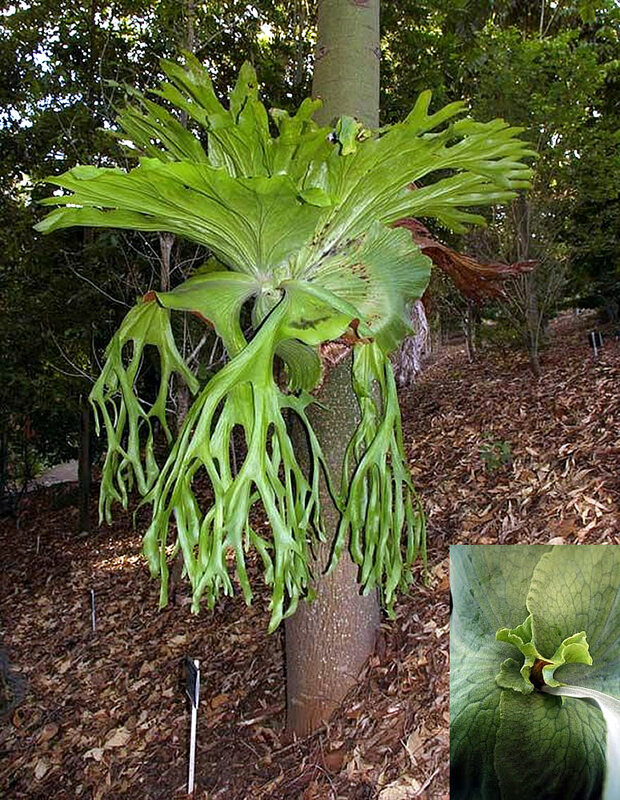 Potting and repotting: Platycerium grande plants are often sold growing on a piece of tree fern or bark. When the sterile fronds of such plants have almost covered their backing, fasten the fern onto larger piece of material, either tying or carefully nailing the two together. To fasten a plant initially to bark wrap the small, spongy root mass in an equal parts mixture of very coarse peat moss and sphagnum moss and tie this bundle securely to the backing with some strong cotton – not nylon – thread. Keep both bark and root mass moist until the roots (which are sparse) and the sterile fronds have adhered to the support. Alternatively, plant the fern in a wooden, slatted hanging basket (similar to those used for orchids) which is filled with same mixture of peat and sphagnum moss. When established, the plant will gasp the slats firmly. Platycerium grande can be grown in pots only when very small, since they wrap their supportive fronds around the pot, which must be broken to sever their hold. It is extremely difficult to move them into larger containers. Gardening: Platycerium grande prefers to be mounted on a sphagnum covered wood plaque. This fern does not do well growing on a hanging basket. Platycerium grande prefers temperatures to be above 15°C (60°F). It will survive short periods of colder temperatures. Damage will begin to occur below 4°C (40°F). Light: Platycerium grande ferns do best in bright light, but not direct sun. It will thrive suspended in the filtered light beneath a canopy of trees. Water: Water regularly, but don’t keep it too wet. The entire Platycerium grande fern and the organic material to which it is attached should be dunked once a week in a dilute solution of fertilizer and rainwater. This species likes high humidity. It will thrive when the fronds are misted daily, but they can do without. Rainwater is best, but soft water can be used. Fertilise: Feed Platycerium grande with diluted liquid fertiliser once a month during the spring and summer. Propagation: Nonclumping species such as Platycerium grande can only be propagated from spores and this can be quite a difficult undertaking. Problems: Scale and mealy bug, sometimes attack Platycerium grande. When immature, Platycerium grande, Platycerium holttumii, Platycerium superbum and Platycerium wandae will look more or less identical to one another. The adults, however, differ from each other in for key aspects: only Platycerium superbum has only one spore patch, the other three species have two spore patches, only Platycerium wandae frills around growth bud and only Platycerium holttumii has thick and spongy sterile fronds. Uses and display: Platycerium grande are grown on a moisture retentive medium such as tree bark, osmunda fern root or sphagnum moss, usually in hanging containers or mounted on wall planters. In frost free climates they can be attached to trees or they are often grown in containers suspended beneath a large tree. Platycerium grande ferns are best suited to greenhouse cultivation, but can be grown in the home if water is supplied regularly. Platycerium grande ferns can grow to enormous size, even with little care and a large specimen is truly impressive.